Click on the REGISTRATION Form to the RIGHT to register. CLICK on the PAYPAL LINK to the RIGHT pay online. Each athlete and parent who is assigned and committed to an indoor travel team, is required to read and accept the MidTN Policy through this online form. Each athlete and parent is expected to follow the policy during practices and tournaments throughout the entire season. A top MidTN coach works with your full team to help get them ready for the season. Email MIDTNVBC@gmail.com for prices. MIDTN PLAYERS HITTING THE SPOTLIGHT ! The Cumberland commitment had 338 kills with 317 digs and 80 aces a year ago. The Clemson softball commitment had 535 kills as a junior and was the District 11-AAA MVP. Our vision is to create an environment where we provide character development, build self esteem, and teach valuable skill sets and good sportsmanship. This environment enriches the players, coaches, and parents by incorporating core values such as work ethic, persistence, discipline, determination, competition, goal setting and accountability. We at MidTN believe that training alongside school programs gives players a rounded development. We want each player to be able to transfer into a college program with the understanding of core skills & the ability to adapt at the next level. Our vision will create players who will be ready to play at that higher level, have universal core values and will positively contribute to multiple communities throughout the nation. We want your child to continue to grow in the sport & still love it! 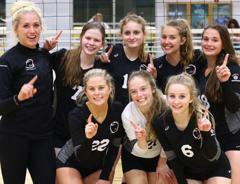 What is Club (travel) Volleyball? MIDTN Volleyball Club is a member of the SRVA / USA Junior Olympic Volleyball Organization, and AAU, JVA youth volleyball programs. Our goal is to be able to offer several level of play for the young athletes based on their ability & desire. 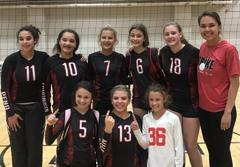 Club Volleyball is an excellent opportunity for your daughter to grow as a volleyball player and play with a variety of athletes from around the area. The season runs from November through April which is a sizeable time and financial commitment. The length of the season, including weekly practices, team events, and tournaments on weekends, requires that BOTH parents and athletes understand this commitment. MidTN's Julia Wheeler was selected MVP as Siegel won the Back-to-the-Boro Tournament which featured 20 teams from Tennessee and Alabama. MidTN's Alia Logoleo makes All-tournament Team as her Youth Continental Red team placed 3rd to earn the Bronze. Chelsea Ross, a Murfreesboro, Tenn. native, transfers to Georgia State from Middle Tennessee State’s court volleyball team. She played outside hitter for the Blue Raiders and appeared in all 109 sets as a senior. Ross led her team in kills (512) and kills per set average (4.70). She finished the season ranked nationally in several categories and was named first-team All-Conference USA in 2014 and 2015. MidTN Alum Chelsea Ross earns All American status! MidTN Players Taking it to the next Level! 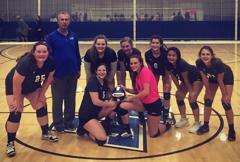 What is MidTN Volleyball Club? 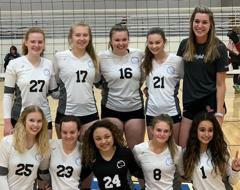 MIDTN Volleyball Club was started here in the Murfreesboro area in 2000 in order to help improve the knowledge and skills of middle and high school age girls in our surrounding area. Our hopes & dreams are to help all players build the confidence & skill set to allow all to reach their potential and fulfill their dreams of playing in college one day!